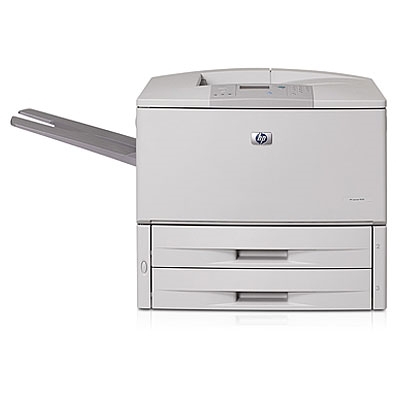 The HP LaserJet 9040dn is a high-volume department printing solution for price-sensitive customers. A 300,000 page per month duty cycle plus reliable, flexible features combine to meet your demanding printing needs at a value you will appreciate. Maximize your resources with this hassle-free device. Remote management capabilities, an intuitive control panel, HP Smart Printing technology, and multiple paper handling options let users focus more on the business at hand and less on the printer. This HP printer delivers fast results with 40 ppm print speeds, handles even the most complex documents quickly with a 533 MHz processor and expandable memory up to 512 MB. Get reliable, proven performance with the HP LaserJet 9040dn and HP LaserJet print cartridge technology. This high-volume printer can easily handle heavy print loads and enables greater uptime with minimal intervention.